Choosing a private school education for our children is one of the biggest decisions we face in family life. Naturally, we want to provide our children with the best opportunities we can for them to grow into smart, emotionally healthy, well-rounded adults. School choice plays a major role. Unfortunately for many families, the cost of private school education can be a barrier to giving our children what we really want. Fortunately, most schools offer some form of financial aid that can help. As a career school business officer, I have been involved in hundreds of financial aid cases. In this post, I am going to share some rudimentary wisdom to help you maximize your financial aid award and establish a mindset to achieve your tuition assistance goals. Before we get into it, let us establish scope. Financial aid can be broadly categorized into two types, need-based and merit-based. Need-based aid, sometimes referred to as a grant, is focused on providing financial assistance to families who cannot afford to pay the full cost of tuition. It is based on the family’s financial capacity relative to the cost of attendance. It is the most common type of financial aid. Merit-based aid, often referred to as scholarship, is based on the applicant’s characteristics such as scholastic or athletic aptitude or demographic profile. Scholarships might originate from the school itself as well as from outside organizations. There are several types of financial aid available. However, this discussion will focus on need-based aid (though there are certainly some points that crossover). Alright, scope set, now let us get our mindset. As with any endeavor, your intention drives your achievement so let’s make sure we’ve got our head on straight. Be determined. Depending on the process, completing an application for financial aid can feel like filing your taxes or writing a term paper. Remember what is at stake and do not let yourself be dissuaded. There may be thousands of dollars worth of tuition on the line which makes it well worth the effort if you think about the return on your time. And do not let what you don’t know stop you. At most you may encounter this process once a year, but for professionals who see hundreds or thousands of financial aid applications, what is unknowable to you is commonplace to them. If you have questions, do not be shy, be prepared to ask until you get an answer. Be realistic. There are some realities to keep in mind. It should come as no surprise that there is not enough aid available for everyone to get a full-ride. You are likely competing for a scarce resource which will be doled out according to the set policy of the school or fund. With diligence, you should be able to get some financial assistance if you demonstrate need but that does not usually mean a full ride, in fact, some policies restrict that. This means you are likely going to have to self-fund some portion of the tuition. For some families, that may come down to an economic choice that impacts lifestyle like changing the type of car they drive or what neighborhood they live in when deciding on private school education. If you are applying for need-based aid, be sure you have considered your priorities and you understand that you are still going to have a financial obligation even if you get the award you want. Keep your eye on the prize. Remember what this is for, the betterment of your children’s future. Enough said. Get the lay of the land. Find out if aid is available, know the policy and know who to talk to. Often schools post their application and policy online. Otherwise, call the school and ask for someone in charge of financial aid, often through the admissions office. Read the policy thoroughly and ask follow-up questions. Besides asking for a copy of the policy and application, ask them what kinds of aid are available. Are there scholarships besides the need-based aid program? Ask who to talk to if you have questions about the application. Many schools utilize a third-party application processor that may have very helpful resources. Be timely. Know and respect the deadlines. Funds for aid are typically limited and first-come, first-served to some extent. Usually, your best shot at the biggest award comes when you are in the first pool of applications to be reviewed when the entire financial aid budget is still available for distribution. Now that does not mean you should throw in the towel if you miss the first deadline. Many schools will not go through their entire budget on the first pass, sometimes they will hold back a portion of the budget for a second or third pass. They may even have the flexibility to adjust the budget based on demand. So press on even if you cannot be first to the table. Be thorough and straight forward. Remember there are likely other applicants applying for a limited resource. An incomplete application can cause delays, allowing funds to be awarded to others before your case is reviewed. Vague or conflicting information can leave the decision committee unsure about how to interpret your financial standing. They are likely to be more conservative in their award decision in such circumstances. When you are done with the details, step back from the trees and look at the forest. Does everything make sense? Does anything seem contradictory? Are there any gaps? Maybe the information is correct but something still seems to be missing. Do not worry, the next step is about ensuring that the picture you are painting with numbers translates into a meaningful mosaic that leaves no doubt as to your true situation. Be descriptive. Sometimes the numbers do not tell the whole story, so you will want to add e color for context. Most applications include room for a narrative, but if they do not, write a letter to the financial aid committee. Is this request the result of a temporary setback? Has there been a change in employment, a health concern in the family? Maybe this is where your family is right now, but you know the value of the educational opportunity and are willing to sacrifice to make it happen? Do not let that go unsaid if you have made hard choices to position your family for private school, that is a demonstration of dedication that a committee will hardly overlook. This is where your knowledge of the policy can pay off. Look at what the school is saying about the purpose and qualifications of their aid program and make sure you describe how your family meets those points. This is your chance to tell the story behind the numbers you provide the financial aid committee. Keep it current. Financial aid committees look at your financial position at a (recent) past point in time. Life happens and things change. Update the committee with important changes in your financial position and request an appeal if those changes mean hardship. Even if the change is mid-year and the funds have been disbursed, keeping your file current will keep your case at the front of mind for the next time funds become available. Finally, if you are already a financial aid recipient, do not become complacent. Most programs are re-evaluated on an annual basis. Be sure to check for any changes in the program and remember to reapply for the next year with all the vigor of your initial application. There you have it. With the right mindset and the financial aid fundamentals you will be on your way to maximizing your family’s award while realizing the best educational hopes for your family. For additional perspective on navigating the financial aid process, check out Robert Kennedy’s article on Private School Review. 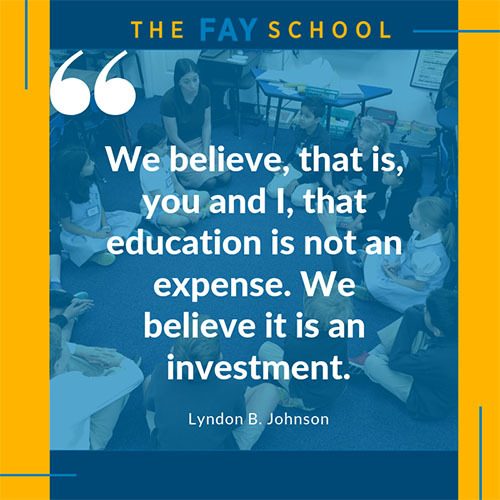 Questions on The Fay School’s Financial Aid/ Tuition Assistance process? Contact Director of Finance and Operations, Jeff Fountain. About Jeff Fountain: Jeff is the Director of Finance and Operations at The Fay School. The son of a teacher, he is delighted to be involved in managing the business of schools and has been doing so since 2005. When he is not knee-deep in spreadsheets, he enjoys spending time with his wife, teenage son, and two dogs.